Posted in Uncategorized and tagged ikea, piracy, the pirate bay. Thanks, Storvik. I was finishing this at 3am last night, so Im surprised it even makes sense…. or that it isnt just a picture of me crying. Nice Coulton reference, y’all. Keep up the good work. Thanks! I was hoping someone would appreciate that. All of them for free. All of them for me. I love his not-gonna-cry look in panel 2. I have the same trembling mouth when I’m trying not to cry at the end of Cool Runnings. This is one of my favorites. Not just because most of the furniture in my old apartment used to be from Ikea. Perfect concept perfectly executed. “used to be from IKEA” because you looked at it too hard one day and the wood pegs holding it all together disintegrated into sawdust. Spontaneous IKEAmbustion. Not quite. Used to be because it all fell apart trying to move it! So, you were pretty close. Since I’m commenting, let me add something to the “cartoony art” discussion from the other thread. I personally think the prison guard is awesome. Not a line is wasted. His expression, hair, everything. Your skills get better every strip. Its certainly not a unique phenomenon. I guess I was the first to give it a proper name. That really flerns my bjorngen. 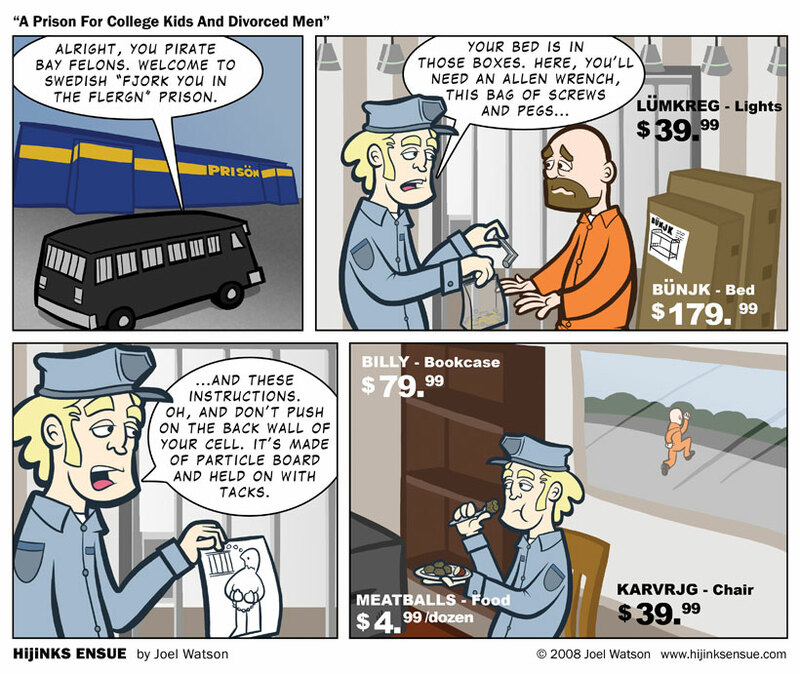 Personally, as a gay man, I would love to be in an IKEA’d prison. I’ll second the quivery lip in panel 2 though. That is pure fried gold. Its a VERY stylish place to be incarcerated. BTW, I just noticed how “Josh dies” is its own tag. There were enough comics on the subject. Seemed to be appropriate. We are working on having him extradited, but those Swedes are ruthless. Pardon the non sequitur, but if you haven’t seen “Ruthless People”…well…you just should, that’s all. I assume this is some kind of moving picture show? Shut up I have an Ikea sofa. (sniffles) its reliable sometimes. Just dont sit on it too hard….or….. at all. Glorious! Will be sure to send it along to the aforementioned peeps. I took my sister to IKEA over the weekend. It was her first visit. She ooed over every square sofa and potted plant. I rearranged the cabinet contents then wrapped myself in the fur throws and reenacted scenes from LOST. Good times all around. My first visit to an IKEA was similarly filled with “oooohs.” The fact that it took us over an hour to “walk through” and “take a look” relieved me of the feelings of wondrous joy. My favorite part is how you can never find the exit. You find maybe two signs pointing the way, sure, but never the exit. You can’t go out the way you came in, heaven forbid! You have to walk past *everything* to get out. If you get out at all. Why? I don’t know why! But for some reason, IKEA JOKES NEVER LOSE THEIR FRESHNESS!!! ….just like their cinnamon rolls….. hrmmm…. The whole damn place smells like bread. Like they pump it in to the air ducts to keep you docile. I wanna go to IKEA prison. I’ll have to find a Swedish progen-pjorgen (that’s how they say “pen-pal” in Swede, I do believe) so I can stalk them, attempt to kill them, and ultimately serve some time in a plush pressboard cell. I wonder how they get those prices to float in the air and be readable from all angles? Simply amazing. We actually bought a really good quality dresser for our baby from IKEA. And, I know it’s an abbreviation but, it doesn’t seem like it should be all caps. I included a link and it wasn’t marked as spam! Great Odin’s raven! Yeah, I read the only reason its any good is that Sony had nothing to do with it. Its all HTC hardware. Akismet is supposed to learn from my SPAM moderation. Maybe its getting the idea. Also, how is new fatherhood treating you? If Billy means bookcase, then does William mean library…? Kapprika like Caprica? or like Paprika? Either way Im on board. Coulton is a warrior poet for the ages. Love the about to cry look. I’ve never owned any Ikea stuff, but I’ve seen stuff everywhere making fun of their instructions. There is an Ikea store two hours south of me in Atlanta, but I’ve never actually been in one. Is their furniture really as bad as everyone says it is? There furniture isnt bad at all. It’s actually quite unique and attractive. The problem is that it is VERY cheaply made. They use paper or veneer covered particle board for everything, no hard wood, no real joinery, plastic when they should use metal, etc, etc. The upside is that it costs less than real furniture, the downside is that it doesnt last very long. Another problem is that most of they beds and couches arent very comfortable passed the 1-2 month mark. You get what you pay for and they are all style – no substance. That said, I have 3 bookcases, a cofee table, an end table, a dining room table and chairs, and two computer desks from IKEA. Ikea does have some furniture on the high end that (appears) very stable. It’s just a lot more expensive than the stuff most of us get there. As you said, you get what you pay for. Pay for the cheaper stuff (all I’ve ever gotten there) and you get less sturdy stuff. Pay for the higher end, etc…. #1 An Actual Swede(tm) responding to my IKEA comic is awesome. That makes my day twice. #2 The IKEA here in Dallas is one of the largest from what I understand. It is a continent and republic all to itself with its own laws and governing body. A tribunal of norsemen sit atop poorly constructed, particle board observation towers keeping an ever watchful eye on the shoppers and citizen below. If you commit a crim in the Dallas IKEA you hope to be extradited back to America to stand trial. Otherwise you face MEATBALL JUSTICE! All joking aside, thanks very much for reading. It's a little mind boggling to image my comics finding their way to Sweden and somehow being enjoyed. I appreciate it. Oh, one more thing, all this about when you go in, it takes a long while to go out. I live about an hours drive from the worlds biggest IKEA-store, and if you’re going there, you’ll have to take a vacation for a week, that plase is huuuge! Adios, and thanks again for lots of laughs! As a Swede, I find the fake Swedish hilarious! The fact that Swedish doesn’t even have the letter ü makes it even better. 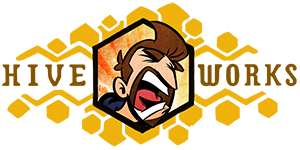 Just found this site, by the way, and it seems nice enough to bookmark. I’m going to go trough the archives now. That kills me. My ignorance of actual Swedish is so blatant that Im making up fictional characters like “U” and putting an umlaut on every vowel. Do Swedes do “fake english” or is the language so ubiquitous that everyone basically knows it? Thanks for book marking the site and feel free to tell the rest of the Swedes. There are like a dozen of you living on an ice flow, right? Yeah, everyone knows English over here, so we don’t make fake versions of it. The phenomenon does occur, though, with other, less well-known languages (like German and Finnish). We do make fun of you, but not so much about your celebrity worshipping, since the same thing is going on in Sweden. We mostly think of you as fat simpletons with nukes and a messed up political system, which is scary, but also quite entertaining from time to time. Aside from the nukes part Sweden is nearly as fat, dumb and politically messed up as the U.S, but we pretend it isn’t. …and that ice flow is melting! Damn this global warming. Where will we – and our polar bears – live? Not all of us, but a LOT of us (including our current leadership). I suggest you befriend a hump back whale. Then when the ice melts you can build a fort on his back. The outside shot of the prison (sorry, “prisön”) cracks me up. Joel, are you going to import the old comments into Intense Debate at some point? Just curious.